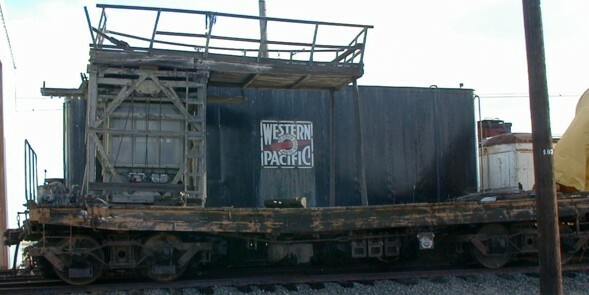 The Western Railway Museum is located about halfway between Fairfield and Rio Vista along Hwy 12 in California. This is just northeast of the San Francisco Bay. The Museum is open weekends all year for tours and trolly rides. They can be reached at (707)-374-2978 or at The Western Railroad Museum Web Site. 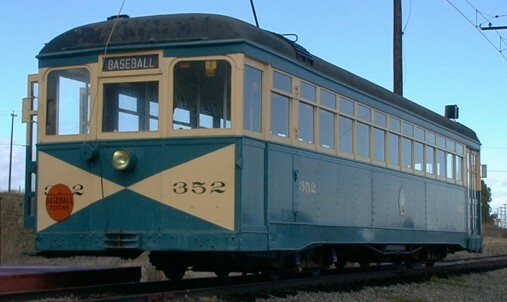 American Car Company built this streetcar in 1911 for the Key System, an traction company that operated all over the East Bay near San Francisco until the line was scrapped in 1948. 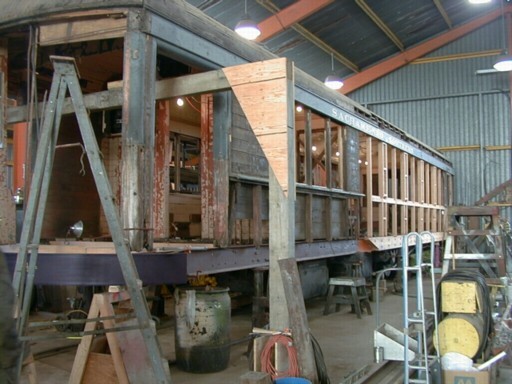 This restored car, and others, are used to haul the public on a few miles of trackage that the museum purchased from UP (formally Sacramento Northern). While the museum specializes in restoring streetcars and interurbans, I went there to take photos of the disused and lonely equipment on the "dead line." This car, I didn't get its ID, was in the shop for major repairs due to an accident. Much of the structure of the car was being replaced. 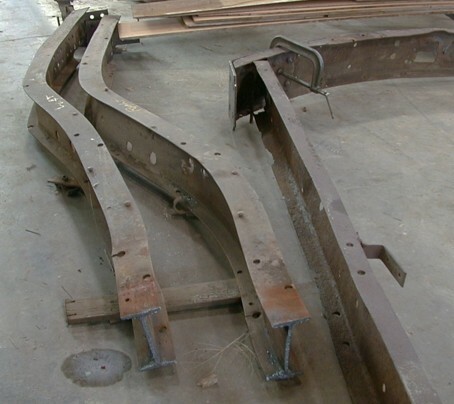 One of reasons for the repairs was due to these frame rails, which used to be a little straighter. 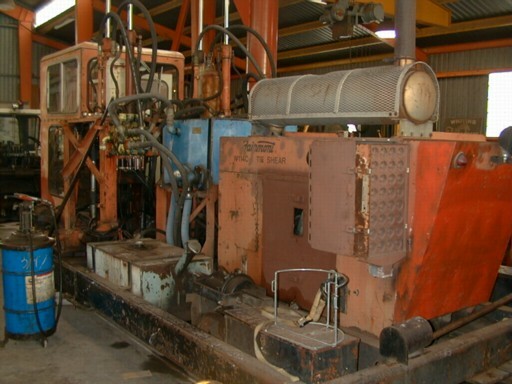 The WRM has three electric mine locos, two of them are pretty conventional heavy box cabs. They said that that they had to take all three from Kennicott Copper to get one of them. This is the one that drew me back to the museum. 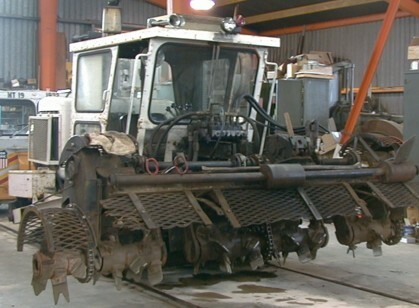 This loco goes to show that there is a prototype for everything. This loco is battery powered. I asked around the staff at the museum that day to get some details, but nobody there knew much about it except that it was dual powered. 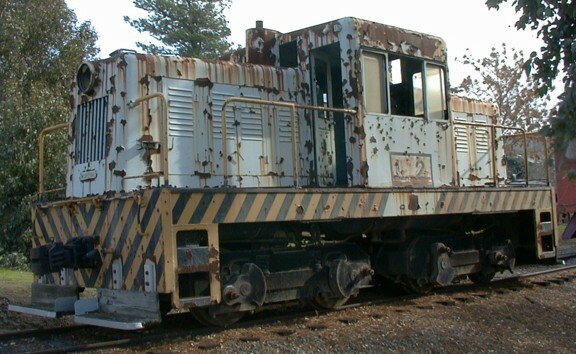 I surmise that this loco was used to run down short spurs off the electrified main line in the open pit copper mine to spot cars and ran back to the main line to pick up power and recharge. The other two were probably used to haul cars out of the pit. Moving tracks around in a mine would be a lot of work, moving overhead as well would be a real pain. Also having overhead all around would be dangerous. This loco hadn't moved from this spot since the last time I was there maybe 5 years before so it doesn't look like it is very high on the museum's priority list. 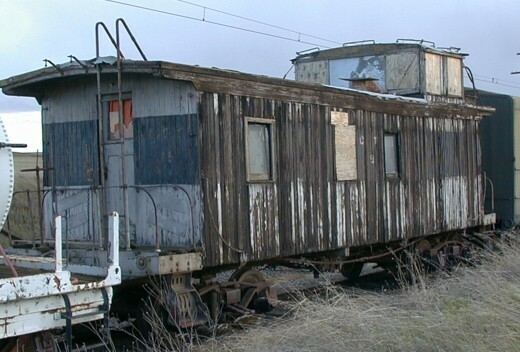 This wooden wire maintenance car has obviously seen better days. 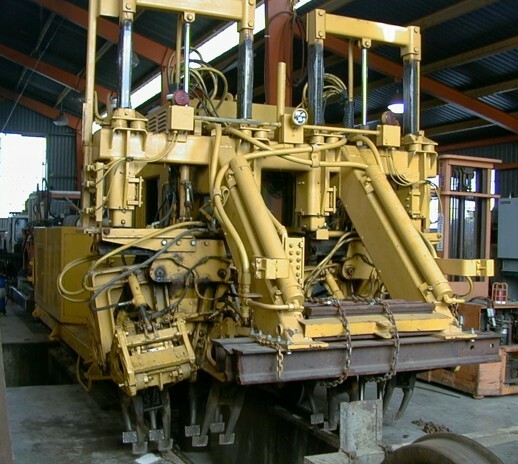 This kind of car was used to work on the overhead wire. Since the platform was wood, the wire could be worked on while it was still energized. 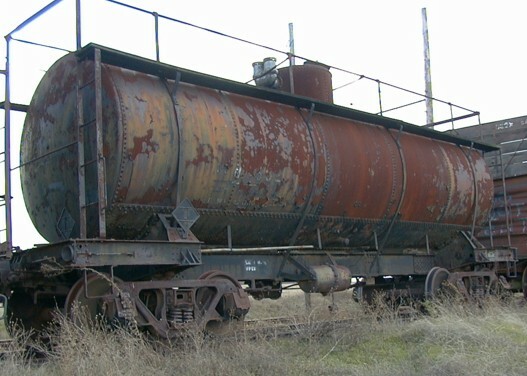 This steel tank car was basically unidentifiable. This is a good example for a truly heavy weathering job. 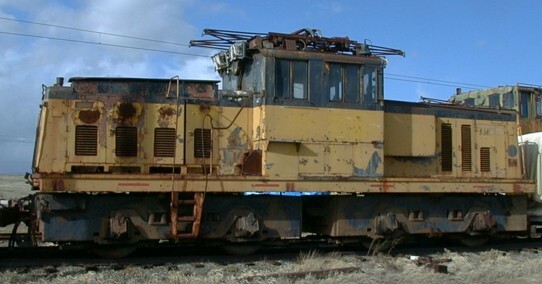 The Porter Manufacturing Company made many small switchers such as this one. I have to assume that this loco is not in running condition. There were other switchers at the museum such as a 44 tonner and a GP9, but I didn't post the photos because they were too ordinary and in much too good of a condition. For many years, the SP ran a beet train down the central valley and the coast route. The cargo was sugar beets and these high side gondolas were used to carry them. 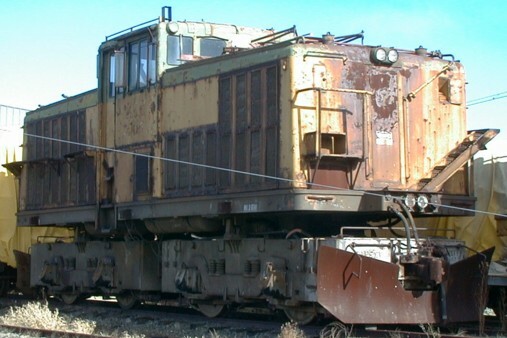 The beet trains are long gone, what beets are left go by truck, but an example of a typical beet car is sitting on the dead line at the WRM. 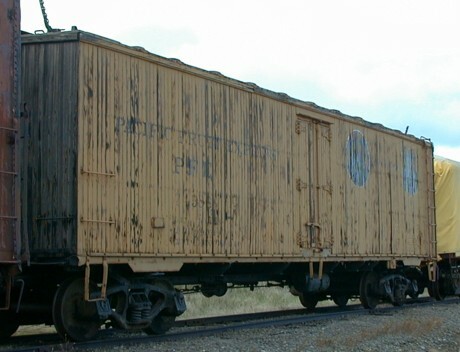 This wooden boxcar was so badly weathered that its roadname was totally gone. Considering the archbar trucks, it probably hasn't carried a revenue load in many moons. 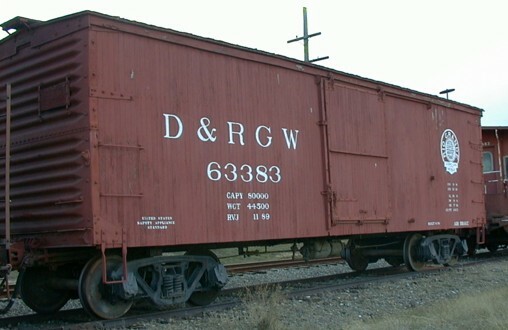 This D&RGW boxcar has probably been restored, it couldn't have been in this good of shape since it last ran. 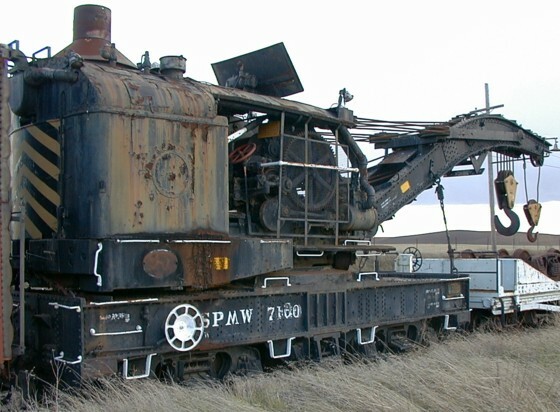 This is one of the last steam powered wrecking cranes still around. Unfortunately, this crane is not in working condition. An SP boom car is attached to the crane. This car looks fairly modern in comparison to the crane. The Central Traction Company ran some freight operations and needed a caboose. It is clear that this version has seen some hard times. 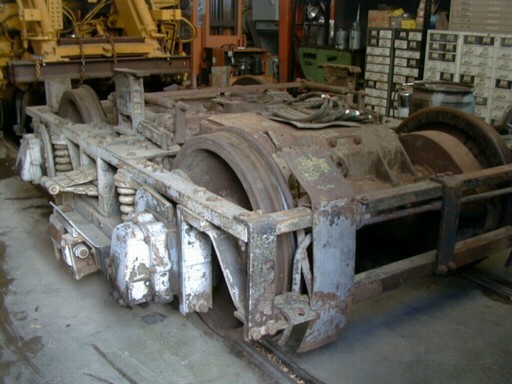 The car is sitting on trolley trucks, it can't be seen in the photo, but the axles are geared. 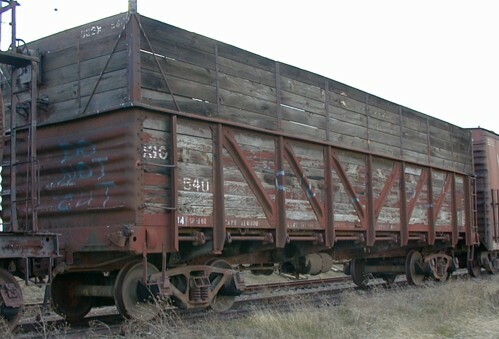 The Pacific Fruit Express ran full blocks of refrigerated cars all over the country until trucks took much of the perishable business away from the railroads. 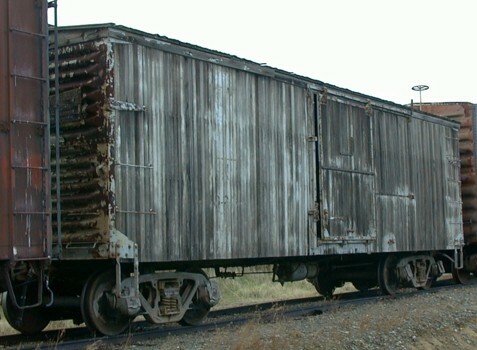 This wooden reefer is an example of an early PFE car. The museum has to maintain their own track. This ballast tamper is not much of a relic, but I found it interesting anyway. The guys in the shop called this a tie shear. It is designed to break up old ties. It would seem to me that a regular tie puller would be more effective than mashing old ties, but they must use it for something. This infernal machine looks like a roto-tiller on steroids. It is used for digging up the ballast after a tie has been pulled. It also has a tie puller mechanism right behind its claws. This powered truck probably came from underneath the wrecked car being restored. Because it has two large traction motors, it is probably an interurban truck as opposed to a streetcar truck which would probably be not quite so big.